The Calcaneus is the largest tarsal bone. It forms the prominence of the heel. Its long axis is directed forwards, upwards and laterally. It is roughly cuboidal and has six surfaces. The anterior surface is small and bears a concavoconvex articular facet for the cuboid. The posterior surface is large and rough. The medial surface is articular above and non- articular below. The articular surface is comma- shaped and articulates with the medial malleolus. The lateral surface bears a triangular articular surface for the lateral malleolus. The surface is concave from above downwards, and its apex forms the lateral tubercle of the talus. The posterior part of the lateral surface is separated from the trochlea by an ill-defined, small triangular area which articulates with the inferior transverse tibiofibular ligament. The posterior surface is small and is marked by an oblique groove. The groove is bounded by medial and lateral tubercles. A posterior tubercle is also present. It is occasionally separate and is then called the os trigonum. The anterior surface is the smallest surface of the bone. It is covered by a concavoconvex, sloping articular surface for the cuboid. The posterior surface is divided into three areas, upper, middle and lower. The upper area is smooth while the others are rough. The dorsal or superior surface can be divided into three areas. The posterior one-third is rough. 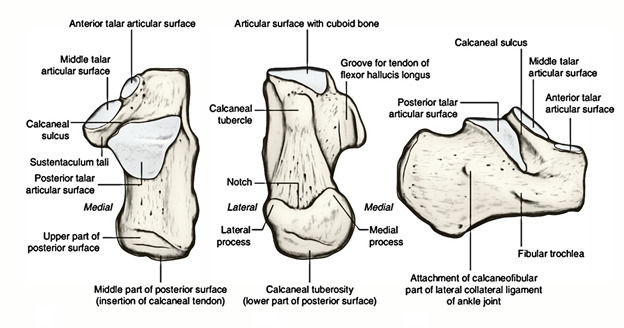 The middle one-third is covered by the posterior facet for the talus. This facet is oval, convex and oblique. The anterior one-third is articular in the anteromedial part, and non-articular in its posterolateral part. The articular part is in the form of an elongated facet present on the sustentaculum tali. The facet, which articulates with the talus, may be subdivided into two facets, anterior and middle, for the talus. The plantar surface is rough and marked by three tubercles. The medial and lateral tubercles are situated posteriorly, whereas the anterior tubercle lies in the anterior part. The latter is separated from the anterior border by a roughened depressed area. The lateral surface is rough and almost flat. It presents in its anterior part, a small elevation termed the peroneal trochlea or tubercle. The medial surface is concave from above downwards. The concavity is accentuated by the presence of a shelf-like projection of bone, called the sustentaculum tali, which projects medially from its anterosuperior border. The upper surface of this process assists in the formation of the talocal­caneonavicular joint. Its lower surface is grooved; and the medial margin is in the form of a rough strip convex from before backwards. The middle rough area on the posterior surface receives the insertion of the tendocalcaneus and of the plantaris. The upper area is covered by a bursa. The lower area is covered by dense fibrofatty tissue and supports the body weight while standing. It can be compared to the attachment of ligamentum patellae. The lateral part of the non-articular area on the anterior part of the dorsal surface provides: (a) origin to the extensor digitorum brevis; (b) attachment to the stem of the inferior extensor retinaculum; and (c) attachment to the stem of the bifurcate ligament. The medial, narrow part of the non-articular area forms the sulcus calcanei, and provides attachment to the interosseous talo- calcanean ligament medially and the cervical ligament laterally. The attachments on the plantar surface are: The medial tubercle provides: (a) originfor the abductor hallucis medially; (b) attachment to the flexor retinaculum medially; (c) origin to the flexor digitorum brevis anteriorly; and (d) attachment to the plantar aponeurosis anteriorly. The lateral tubercle gives origin to the abductor digiti minimi, the origin extending to the front of the tubercle. The anterior tubercle and the rough area in front of it provide attachment to the short plantar ligament. The rough strip between the three tubercles affords attachment to the long plantar ligament. The attachments and relations of the lateral surface are as follows. The peroneal tubercle lies between the tendons of the peroneus brevis above and the peroneus longus below. The trochlea itself gives attachment to a slip from the inferior peroneal retinaculum. The calcaneofibular ligament is attached about 1 cm behind the peroneal trochlea. The attachments and relations of the medial surface as follows. The calcaneus ossifies from one primary and one secondary centres. The primary centre appears during the 3rd month of intrauterine life. The secondary centre appears between 6-8 years to form a scale-like epiphysis on the posterior surface, which fuses with the rest of the bone by 14-16 years.